MotoGP official charity Two Wheels for Life have launched their virtual gifts, ‘Gifts for Life’ in time for the holiday season. The gifts, which come in £15, £20, £30 and £45 denominations, provide support and/or training to give greater access to healthcare for rural communities in Africa. The programmes that Two Wheels for Life support rely on additional funding to keep getting reliable healthcare to the most remote communities in Africa. 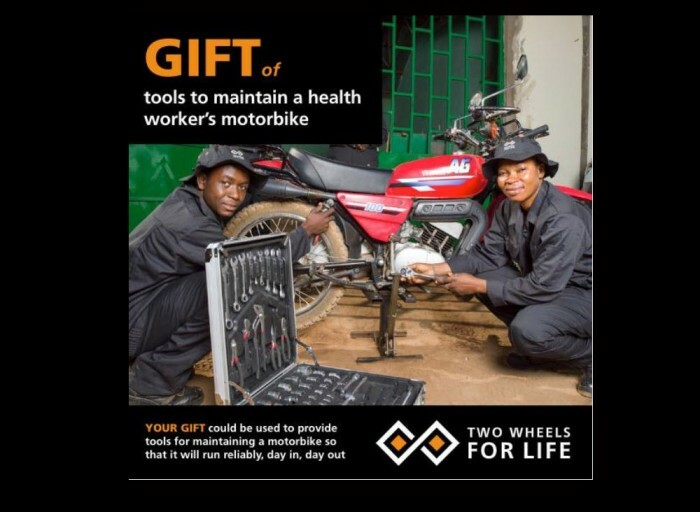 Whether it’s training for a healthcare worker so they’re confident and capable riding a motorcycle, or replacing parts for the motorcycle they ride, Two Wheels for Life ensures that the donations and gifts go wherever they are most needed. Gifts for Life are a great purchase for the motorcycle fan in your life or for the person who has everything. Or maybe for the person who just wants to share the way motorcycles can save lives. They’re not entirely virtual either. The recipient will receive a beautifully designed card explaining what the gift means to the programmes that Two Wheels for Life supports. Each gift can be personalised by the sender and the different cards include quotes from some of MotoGP’s favourite stars including Cal Crutchlow, Jorge Lorenzo and Randy Mamola.